Samuel Adams | Beer Apprentice - Craft Beer News, Reviews, Interviews and Info. Hello again guys. 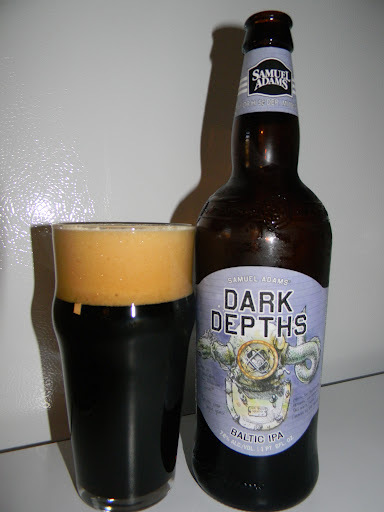 For today’s craft beer review I’m going to be trying the Samuel Adams Dark Depths Baltic IPA produced by the Boston Beer Company located in Boston, Massachusetts. Just picked this up yesterday and thought I would give it a try. Let’s see if we can find any information about it on the breweries website, samueladams.com. How ’bout a sip or two? The Dark Depths came in a 22 oz. bottle and it had an ABV of 7.6%. The beer poured a dark brown with and underlying ruby tint. It was clear too. I could actually see right through it when I held it toward a light source. The head was off white, very full, thick, creamy and frothy. The size was tremendous and the retention time was great. The lacing was both patchy and clingy. This beer looked really nice in the glass. The nose seemed very, very light and relaxed at first, but it gradually came into focus the longer it sat. It revealed hints of earth, toasted breads and some very faint dark fruit notes (plums, grapes). I found some citrus and piny relishes along with some very subdued chocolate and coffee hints. It wasn’t too strong or robust, but everything did seem to be balanced very well. The taste brought forth quite a bit more of the chocolate as well as some slightly charred coffee beans. It was still rather earthy though as it continued with some toasted bread and biscuit savors. The hops were citrusy, piny and grassy. I didn’t really find any of the dark fruit flavors that were noticed in the aroma, although the coffee beans and chocolate totally covered for any misplacement. The mouthfeel was medium to medium/full bodied. It was very smooth, slick and very dry. The carbonation was quite good and a plethora of flavors were left behind long after each sip. Yeah, this is another decent beer. It does kind of follow that Black IPA trend that’s been happening over the past year or so, but it’s still worth a try if you like that style. It personally has never been a favorite of mine, but that doesn’t mean that I don’t enjoy one on occasion. I just can’t make a night of them. This beer didn’t really stand out as being anything special, however it wasn’t anywhere close to being horrible or off putting either. It was well balanced with plenty of a aroma and flavor and it made for a relatively easy drink on this lazy Saturday afternoon. I’d say pick up a bottle if you see the Samuel Adams Dark Depths Baltic IPA, but I, personally, wouldn’t go out of my way to find it again. That’s just my opinion of course, so try it yourself and see what you think and let me know your thoughts. For today’s craft beer review I’m going to be trying the Samuel Adams Octoberfest brewed by the Boston Beer Company located in Boston, Massachusetts. This is a brew that I, like most, try to pick up every year just to see how it stacks up to the other Oktoberfests on the market. Let’s get to the website, samueladams.com. Brewed with five varieties of malted barley for a big, rich flavor. The first thing you notice when pouring a glass of this seasonal beer is the color. 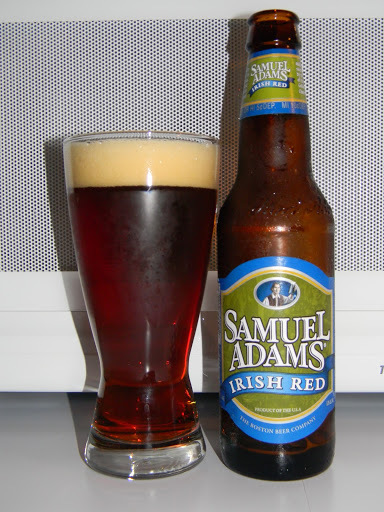 Samuel Adams Octoberfest has a rich, deep reddish amber hue which itself is reflective of the season. Samuel Adams Octoberfest masterfully blends together five roasts of malt to create a delicious harmony of sweet flavors including caramel and toffee. The malt is complimented by the elegant bitterness imparted by the Bavarian Noble hops. Samuel Adams Octoberfest provides a wonderful transition from the lighter beers of summer to the heartier brews of winter. It poured a clear, amber/copper/rust color with some burnt orange highlights circling around the bottom of the glass. The head was a light cream color of good size with average retention and some fair lacing left behind. The crown was smooth, soft and sort of creamy. The nose started with some jolts of caramel sweetness. Subtle spices of nutmeg were intermingled with some earthy hops and tones of fresh grain, which were enhanced even further by a fragrance of dried, crumbled leaves. It seemed to be balanced very well, however it wasn’t anything out of the ordinary for the style. The taste revealed slightly toasted bread crumbs along with more of the sweet caramel malt. A moderate graininess joined the party and the spices gave a slight sting and really held their own. In fact, the spices kind of became the defining factor after the brew warmed considerabley. Again, fairly well balanced and decent. The mouthfeel was medium, crisp, smooth and dry. A decent bit of flavor was left behind, which created a somewhat chewy feel. Not bad. Overall, this beer is pretty good in my opinion. It’s a mostly straight forward Marzen. It’s not anything too crazy or misinterpreted. Sometimes I like a brew that’s a little more to the point like this one is. 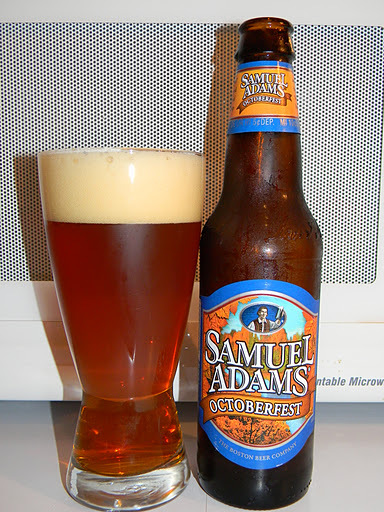 The Samuel Adams Octoberfest is easily drinkable, very sessionable and completely fits the mood of the season. I could picture myself sitting around the campfire on a cool, crisp, Fall evening enjoying several of these. If you haven’t had this years version of the Samuel Adams Octoberfest yet, pick up a bottle or two. The recipe hasn’t changed much (if at all) and it should match up well against the plethora of other Fall seasonals out there. Thanks for reading everyone. Have a great day.